The special court in Ranchi has found the RJD chief Lalu guilty in one of six cases; former Bihar CM Jagannath Mishra acquitted. In a crushing blow to Bihar’s main Opposition party RJD, its national president and life force Lalu Prasad Yadav was on Saturday convicted by a special CBI court in Ranchi in a case of the state’s Rs 1,000-crore fodder scam that was unearthed 21 years ago. The 69-year-old leader, a former Bihar chief minister for two terms and former railway minister, was among 16 accused who were convicted by judge Shivpal Singh. Congress leader Jagannath Mishra, 80, who served as Bihar CM immediately before Yadav, was acquitted along with five other accused. The court will announce the quantum of sentence for the convicts on January 3, 2018. Yadav, for whom this is the second conviction in the infamous scam, was taken into custody minutes after the verdict was delivered in a packed courtroom. Apart from Lalu, Mishra and 20 others accused were present in the court of special CBI judge Shivpal Singh. Justice Singh had completed hearing the case on December 13 and asked all accused in the case to remain present in court for the judgment. The verdict is on the Bihar’s Rs 1,000-crore fodder scam case in which RJD chief Lalu Prasad Yadav is an accused, his family and the party’s leaders and workers braced themselves for the judicial outcome with bated breaths on Friday. Nearly 50 RJD legislators and senior leaders of the party had gathered at the court in Ranchi along with thousands of RJD supporters from both Bihar and Jharkhand. 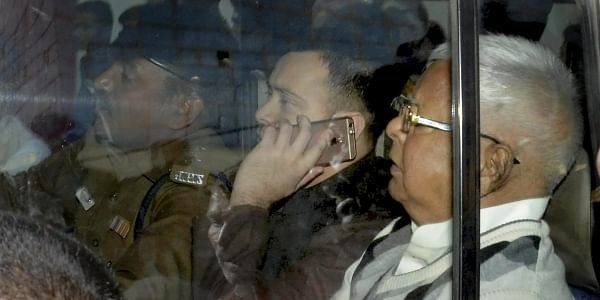 Yadav, who was accompanied by his younger son and Bihar Opposition leader Tejaswi Yadav in the courtroom, appeared tense and refused to answer journalists’ questions after being convicted. He was taken to Birsa Munda Central Jail at Hotwar on the outskirts of Ranchi. This is the seventh time he was being jailed for his alleged involvement in the fodder scam. Convicted in a fodder scam case today, Lalu Prasad Yadav has now been brought to Birsa Munda Central Jail. RJD chief Lalu Prasad Yadav attacked the BJP over his conviction in a fodder scam case, accusing the party of playing "dirty politics" to get votes by tarnishing the image of its opponents. Jagannath Mishra, who was accompanied by his son and JD(U) leader Nitish Mishra, expressed gratitude for the judiciary for his acquittal, saying he had “absolutely no role” in the scam. Senior party leader Jagdanand Singh said that the Rashtriya Janata Dal (RJD) will challenge the special CBI court's order in the High Court soon. RJD leaders had earlier said a possible conviction for Lalu would have little impact on the party’s workers, who displayed their “total faith” in him by enforcing Bihar bandh on Thursday. The RJD chief was earlier convicted in a fodder scam case and sentenced to five years in prison on September 30, 2013. After spending 87 days in jail, he walked out on bail granted by the Supreme Court. He has since been facing trial in five other cases of the scam that was unearthed in 1996. Yadav, who had arrived in Ranchi on Friday accompanied by younger son Tejaswi Prasad told reporters, "Ï have full faith in the judicial system." He faces three other cases related to the fodder scam. The RJD chief also appealed to his supporters in Bihar to maintain peace and order irrespective of the verdict. Former MP R K Rana, three former IAS officers -- Phoolchand Singh, Beck Julius and Mahesh Prasad -- are also among the accused in the case. Yadav has so far spent 375 days in jail in connection with the fodder scam. In five jail stints between July 30, 1997 and January 27, 2002, he spent 288 days behind the bars. The fodder scam case relates to the alleged fraudulent withdrawal of Rs 95 lakh from the Deoghar treasury from 1991 to 1994. The corruption scheme involved the fabrication of ‘vast herds of fictitious livestock for which fodder, medicines and animal husbandry equipment was supposedly procured over a period of 20 years'. On January 27, 1996, the deputy commissioner of West Singhbhum district, Amit Khare conducted a raid on the offices of the animal husbandry department in the town of Chaibasa in the district under his authority. The documents his team seized and went public with, conclusively indicated large-scale embezzlement by an organised mafia of officials and businessmen. In June 1997, the CBI filed chargesheets against Prasad and 55 other co-accused. The accused had 63 cases registered against them under three sections: IPC Sections 420 (forgery) and 120 (b) (criminal conspiracy) and Section 13 (b) of the Prevention of Corruption Act. Due to the pressure of the ruling Janata Dal, Prasad had to quit as the chief minister in 1997 but he formed another party, Rashtriya Janata Dal, and made his wife Rabri Devi the chief minister. A Disproportionate Assets (DA) case was also registered against Lalu in 1998, with Rabri Devi being named as a co-accused for abetting the crime. A special CBI court in Ranchi acquitted both Lalu and his wife on December 18, 2006 in the DA case. Former Bihar chief minister Jagannath Mishra was earlier convicted and sentenced to five years of imprisonment in one of the fodder scam cases.